House Speaker Paul Ryan and Senate Majority Leader Mitch McConnell made sharply worded statements a Muslim couple over Donald Trump the GOP presidential nominee who appeared at the Democratic convention, defying their GOP presidential standard-bearer, Donald Trump. 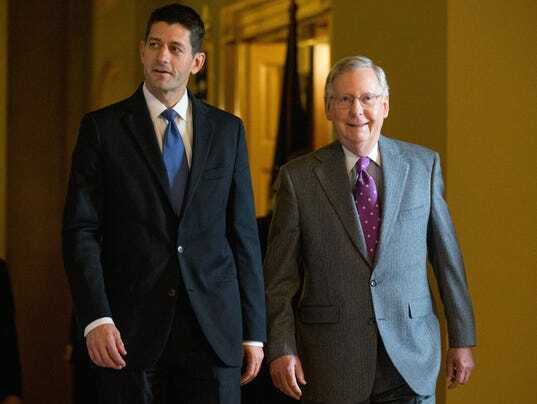 The two establishment republicans (who have been in office many years to long) and can’t keep their mouths shut and at every opportunity bash Trump. Mr. Khan, had the chance provide us clarity and truth from a Muslim man who lost his son 12 years ago, an American Soldier, to Islamists Terrorist. Instead you took the opportunity to support a sitting president and Hillary Clinton, who had abandoned Four Americans in Benghazi at the hand of Islamist Terrorist and lied about it. Mr. Khan, you had the chance as a Muslim family that stood with the principles, values of liberty and freedom in which you have found a home. He chose to make a speech that politicized the death of their son at the hands of Islamist terrorist and to benefit a wanna be president. Khizr Khan, who during their appearance blasted the GOP nominee for his immigration policies. Khizr Khan questioned at one point whether Trump had even read the Constitution. Trump implied that Ghazala did not speak during the appearance because she was forbidden to since she is a Muslim woman. McConnell said Sunday that their son, Humayun Khan, an Army captain who was killed in 2004, was an "American hero," adding, "Like all Americans, I'm grateful for the sacrifices that selfless young men like Capt. Khan and their families have made in the war on terror." The Khans have since implored congressional Republicans, specifically McConnell and Ryan, to rescind their endorsements of Trump. McConnell did not do so in his statement on Sunday. But he did not offer any words of support for Trump either, instead reiterating his view that Trump's previous call to ban all Muslims from entering the country is "simply contrary to American values." Trump now says immigration should be stopped from countries with links to terrorism. Ryan echoed McConnell's opposition to the earlier, religion-centered ban. "As I have said on numerous occasions, a religious test for entering our country is not reflective of these fundamental values. I reject it," Ryan said. And he too was supportive not just of the Khan's son, but the Khans themselves. "Many Muslim Americans have served valiantly in our military and made the ultimate sacrifice. Capt. Khan was one such brave example," Ryan said. "His sacrifice — and that of Khizr and Ghazala Khan — should always be honored. Period."